In 1946, Gebrüder Faller was founded in Stuttgart, Germany, by brothers Edwin and Hermann Faller to make miniature wooden house kits. The company later relocated to the brothers' home town of Gütenbach. 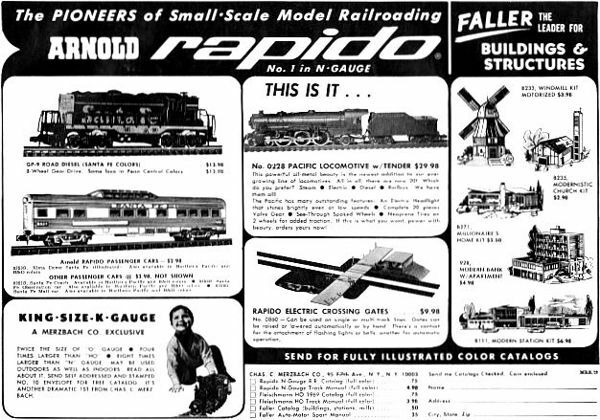 Over time their product line expanded considerably to include model railroad structures, amusement rides, figures and scenery-making supplies in HO, TT, N and Z Scales. Introduced in 1963, Faller's Auto Motor Sport (AMS) line grew to become quite extensive; by the mid-1960s, they were purchasing cars from market-leader Aurora Plastics. Combination roadway/railroad sets were imported into the United States by Charles C. Merzbach Company Inc. of New York (who also imported Arnold Rapido) under the brand name Western Star Road & Rail. In 1968, the N Bus System was added to the AMS line; together with a select group of N Scale plastic structure kits, they were imported into the US by Aurora Plastics and sold under their Postage Stamp Trains brand. The market for AMS began tapering off in the early 1970s, and by 1985 production had ended; they've since become collector items. Faller is distinguished among their peers as having survived over seventy years intact; they also have an extremely broad product range, selling in excess of a million items each year. They've even published their own modeling magazine for many years. Faller is also known for their Car System in both HO and N Scales. It consists of battery-powered vehicles with magnets attached to the front wheels for steering; the magnets follow steel wires hidden under the road surface. The system is used extensively, and to great effect, by Miniatur Wunderland in Hamburg. In 1997 Faller acquired Pola, a former competitor in the structure kit market; the Pola name was retained for their G Scale structures; the rest of the product line was fully absorbed into Faller's. For decades, many of Faller's older kits have been rebranded by Model Power (now owned by Model Rectifier Corporation), Life-Like (now part of Walthers), Associated Hobby Manufacturers (AHM, now IHC), Atlas, Precision Miniatures, Parkway Industries and others. Their kits were also imported into the US directly by Charles C. Merzbach; this ad features three kits that were also branded for Postage Stamp: 4152-250, 4162-125 and 4111-250. Additional details on the history of Faller can be found here.